Microsoft unveiled three new titles at E3 2018 set in the Gears of War franchise, though it has dropped the "of War" from its name, opting just to call them "Gears" . 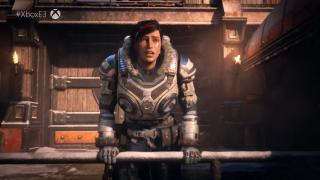 The biggest unveiling, of course, was Gears 5 and it's coming to Xbox One and presumably PC, too, in 2019. Following the story of Gears of War 4, we saw a bit of Marcus Fenix in the trailer, and the gameplay looks to be going deeper in terms of melee combat. Especially good news is that there look to be plenty of good-looking vistas, so we won't be stuck in drab industrial environments like we've seen in the previous entries. Microsoft also talked briefly about two new Gears titles, Gears Pop and Gears Tactics. The first is a 2019 mobile game that takes on the look of Funco Pop's iconic figurines, but there's no word yet as to what the gameplay will be like. Gears Tactics, a PC exclusive without a release date, brings XCOM-like tactical, isometric gameplay to the Gears universe. It's set 12 years before the first Gears of War game, but no other details of that title are currently known. We'll be going hands-on with whatever Microsoft has on offer at its booth, so stay tuned for impressions.